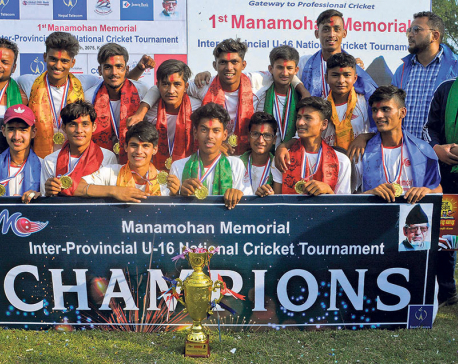 KATHMANDU, April 30: Province 5 has registered a three-run victory over Province 2 in the ongoing first Manmohan Memorial Inter-province U-16 Cricket Tournament on Sunday. In the match played at the TU Cricket Ground in Kirtipur, a half-century from Sijan Makaju helped Province 5 win the match. Province 5 won the toss and opted to bat first and presented a target of 154 runs for the loss of all its wickets in the allotted 30 overs. In reply, Province 2 failed to chase the target and was limited to 150 runs for the loss of nine wickets in the allotted 30 overs. Makaju hit 50 runs off 54 balls with three fours and three sixes. Sonu Sharma was the pick of the Province 2 bowlers as he pocketed three wickets giving away 25 runs in the three overs he bowled. Bibek Yadav, Nikhil Singh and Bikram Kushwha claimed two wickets each. Tripta Raj Das hit 50 runs off 50 deliveries including five boundaries and a six, while Yadav scored 25 runs off 38 balls which included a four. Kushal Malla took three wickets giving away 23 runs in his six overs spell, while Ramesh Kurmi picked up two wickets. Malla was named the man-of-the-match. In the first match played on the same day, Province 1 defeated Province 6 by four wickets. Province 1 won the toss and elected to field first and was given a target of 95 runs by Province 6 for the loss of all its wickets in 20.2 overs. In reply, the winning team chased the target in 26 overs for the loss of six wickets. Prakash Jaisi hit 33 runs off 18 balls including five fours, while Bhabin Kumar Saru Magar scored 16 runs off 23 deliveries which included three boundaries for Province 6. Dipesh Kandel claimed three wickets giving away 24 runs in six overs, while Luv Kamat and Navneet Karna picked up two wickets each. Karna hit the highest 23 runs off 41 balls including a six and two fours for the winning team, while Kamat and Abhishek Baral added 21 and 15 runs respectively. Jaisi and Dipak Thapa picked up a wicket each for the losing side. Kamat was named the man-of-the-match.